How to get to the Gamescom? Because I was asked quite often how to get in, let's answer the first question right away: how can you show your game at the MEGABOOTH? First you should subscribe to the newsletter and wait for the announcement of the convention you want to take part in as an exhibitor. Former MEGABOOTH exhibitors and the team around Kelly Wallick and Christopher Floyd playtest all games and look for a nice mix in genre, visuals and gameplay. 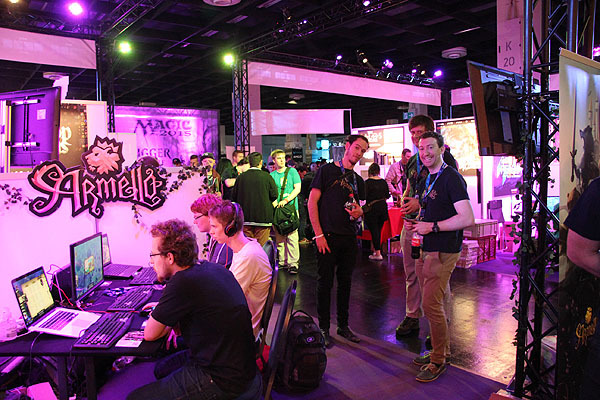 For the Gamescom in Germany 34 teams were chosen who presented 36 games on 362 m². Since we had the go since July to be part of the MEGABOOTH debut in Germany and the necessary backup from our publisher to stem the weight of costs, our planning started. The best thing about the MEGABOOTH is that you don't have to think of all the unpleasant parts of an exhibition, like how to build the booth and where to rent the hardware. Instead you can nicely concentrate on all the visual and physical materials necessary to present your game's beauty. 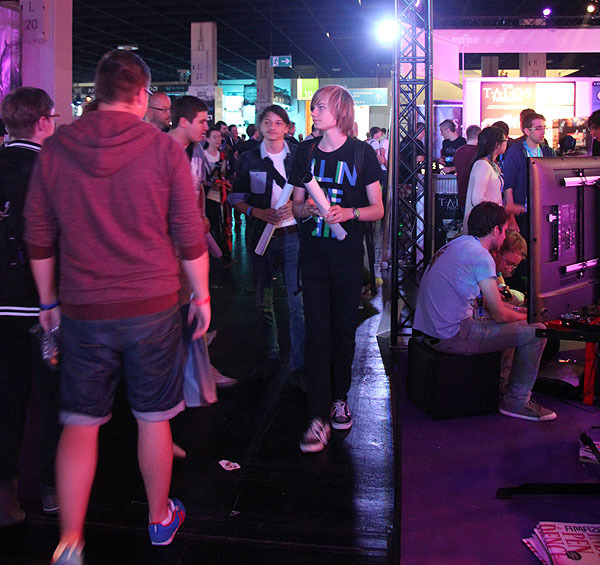 We had the naive idea to finish our game TRI punctually for the Gamescom, then go there and present a finished game. Right ... Keep in mind that taking part in an exhibition will take at least two weeks upfront of your time. And believe me when I say all the mail communication and design for and production of buttons, postcards and posters will consume all of your time - except if you are a multi-tasking genius or have a bigger team. I thought about nice stuff to hand out, like buttons (150 pieces), postcards (1000, could have been more!) and hand-crafted press kits (30, too few), and also the XXL-poster for the booth itself. Eventually we received large character displays and stickers from Friedrich's amazing parents. My learning: don't do the press work two weeks before the Gamescom as most journos will already be booked with appointments. Although I'm super-happy with the response this time and that most of the invited journalists at least agreed on coming by if they found some time. Starting everything earlier is my big goal for the next convention, now that I have so many contacts readily collected. What I didn't do was contacting Let's Players. After attending the Rezzed in March this year, which was 100% devoted to showcasing games via Twitch or YouTube, it was weird to see so few people documenting the GC with their phones and camera. On the other hand the professional and bigger YouTubers couldn't take two steps in the halls without meeting their fans who demand photos with them. We were lucky to get invited by the Game One team to their livestreams, nonetheless, which was a crazy experience. 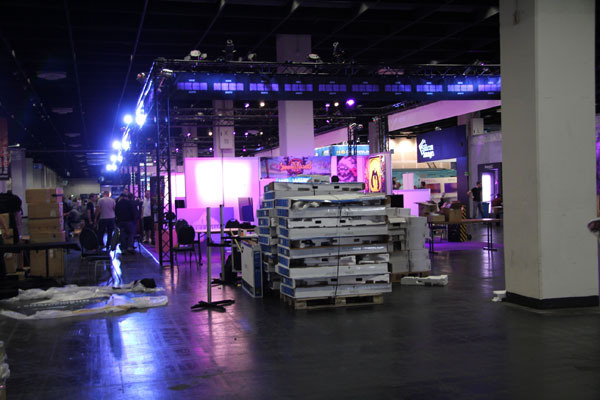 The Gamescom had different halls that hosted the business area (4 and 5), the entertainment area (6-9) and the hardware and comic market with the cosplayers - that was where the MEGABOOTH has been placed (hall 10). A really great thing about the assemblance: it doesn't matter how big your name or how famous your game is - all our booths had the same size in space and XXL-posters. You get a table, two chairs, a PC, monitor and a large TV. More hardware or furniture could have been ordered or brought along by yourself. Logitech sponsored mouse, keyboard, controllers and headphones, which we could keep after the show. Nice. We arrived at the GC on Tuesday to prepare our booth. Arranging a table and the large flatscreen shouldn't be a problem when you decide to go for minimalism as it suited our game and wallet best. We just tried to put everything in a way to make everything visible from every angle and didn't create a psychological border that kept people from trying out our game. By adding some stickers while setting up fox and monk we were quickly finished, while we could see what the others did with their space. I think Armello with their superb characters and fake ivy and moreover Dex with the Cyberpunk-fluids-and-cables construction should be mentioned for bringing up the greatest designs for their spaces. In theory on Wednesday only exhibitors and press can access the whole area. In practice it's already a run for the big players as many exhibitors tend to bring their families over and the under-aged business men turned out to be winners of the Wildcards that people without press or exhibition passes could have applied for on the internet. My advise after this year is: use this day and make some handshakes in the business area to get contacts. The business area is stuffed with publishers, platform holders (Steam, gog.com) and hardware developers (Oculus, Nvidia). Even without an appointment you might get a business card or introduce yourself. Instead we mostly stood at our booth because it was just the two of us, and we seldomly took turns. We rather refined psychological tactics to guide people to play our game. Especially helpful was Thorsten Wiedemann's (director of the Amaze festival) INDEPENDENCE AMAZING, a large 20-pages old-school newspaper packed with interviews and articles that needed to be held wide-armed for reading. We gave them out to by-passers to stop them in their rush through the hardware hall. You will observe an interesting effect: if you gather a group of people, even more will follow and your viewers soon will crowd the little space and raise even more attention. But if nobody stands there it gets harder to persuade people to take a look to the left or right instead of walking straight out of the hall. So it's wise to guide interested sidewalkers to your game. Talking to people at the GC must be strange for foreigners as most people will be from Germany and therefore prefer the German language to talk in. Which was an awesome feeling for us as we are used to talk about TRI in English to reach a wider audience. But for the first time it was a home match and we needed to develop the game's pitch in German as well. While of course a lot of people will come from all over Europe to celebrate games and hope for some words in English, too. So you will get an interesting demographic and very European slice of players from here. Over the week we learned to guide people to our booth and even asked press to get to us after finished filming at nearby booths. One thing is clear: don't be shy but also don't be too pushy. Watching the people standing at your booth more closely, you will also learn that some of them need to be asked to try your game. A lot of the visitors are too shy to just make the step themselves (so much about psychological border). It was also a pleasure to get direct feedback for the game, as most folks watched our trailers on the TV and outspoke quite honest and loud what they thought. On the graphical part and also showcasing the interaction we can be fully happy with our work, as our overall look&feel set itself apart from other games and was rewarded with so many compliments. Therefore we added our laptop to the playable devices on the second day. While Friedrich used it to instantly fix bugs and give new builds to our one playable device on Wednesday, we realized that one PC just isn't enough. We decided to have only one station in the first place because we couldn't estimate the interest for TRI. Having too much PCs might have led to orphaned and sad-looking stations, but with a fair of 335,000 attendees that won't be the case. Especially as soon as people heard that you can play games in hall 10 without waiting in line! I only wish we could have spread the word a bit more to people interested into smaller games by handing them some MEGABOOTH cards at the exits of the other halls to guide them directly to hall 10. I still wonder if it was either perfect that we were in our 'own' hall among the creative bunch of cosplayers and Magic cards while still being able to talk to each other because of not being constantly surrounded by over-powered bass. Or would it be better not to separate indies (let's get rid of the name!) from AAA games, but risk that the player's heads might be already filled up with the blockbusters they know instead of looking for fresh titles in an assembled collection. I would like to see an entertainment area where people can decide on their own if they want to play smaller titles instead of needing to search for them. Not to forget that there already was the Indie Arena booth (assemblance of mostly German and Austrian indie games like Schein or Team Indie) placed between Nintendo and Bethesda. Their booth was mostly overcrowded with indie fans but also filled with bad acoustics surrounding them in return. What would have been better? No idea. Instead we enjoyed to talk to our visitors in person, get criticism and find some time to meet with who came by to say hello. We also handed postcards only to people that at least took a closer look at TRI, because we felt just smashing random people with cards doesn't make any sense. Going for personal communication instead of mass amusement seemed to work out for us. While "Are games art?" was last year's interviewer's most favourite question, this year we got mostly asked if it is still cool to be called 'indie'. 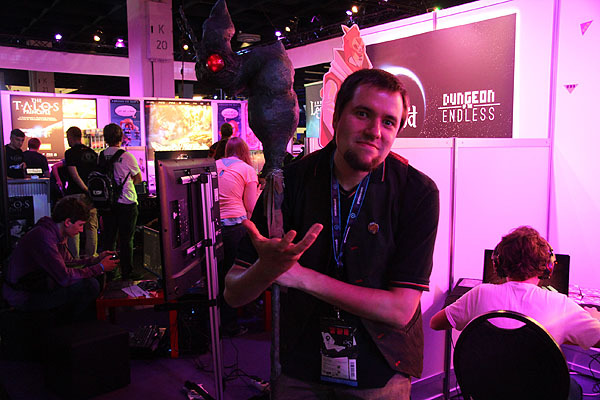 The MEGABOOTH landed in Cologne with an amazing reputation they got from the PAX shows since their debut in 2012. Being part in this fresh, beautiful and extremely diverse collection did celebrate the term indie in a lot of ways. Although with no doubt without a publisher we couldn't have spend money for the show. On the other hand 'indie' only means something to just a few German players and the press, therefore the MEGABOOTH needed to build their reputation in Germany anew. When I took a break to spend my time standing in queue for an hour to see the Witcher 3 - Wild Hunt live-gameplay I talked a lot to the people standing in line. Against any speculation about waiting for a game (if it doesn't take you eight hours like for Call of Duty) it is really fun to speak to the fans of a game you like as well and socialize a bit. I exchanged some of my TRI postcards for sweets and talked about indie games. 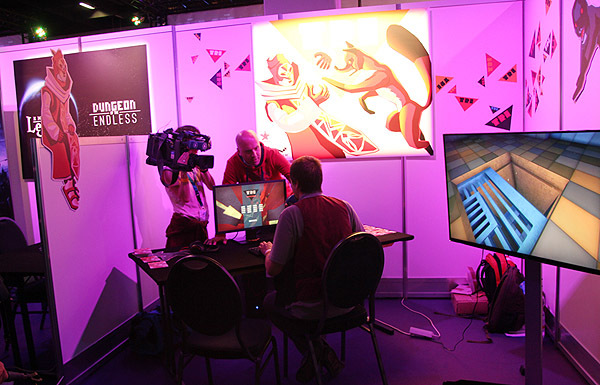 Standing at the big players' booths and hearing that normal people haven't heard of indie games before and are not really interested in unknown stuff can be pretty humbling. I guess that answers the question whether indie 'still' is cool in another way. While it served as a quality signet for games like World of Goo or Braid it has worn off since then or never really arrived here with the same impact as it did in America (or did I mistake that from the games press?). As most games are too diverse and the 'genre' (was it ever one?) has become the business model of choice without necessarily representing a certain type of game. Or is there still a difference, as we all receive good credit for our games at the MEGABOOTH as being the most interesting and surprising bunch of teams showcasing their games at the GC. Presented by the developers themselves! We got asked quite often if attending the very own booth and standing there for a whole week was worth our time and money. I guess you can't compensate that in money or sold copies. But being able to present our nearly finished game to an audience consisting of an extremely diverse range of players and also other developers who came by – that was extremely important for us. Especially as we were attending the Gamescom (back then known as the Games Convention in Leipzig) since we were students. But it's a whole different world if you present your university prototypes just for fun, being able to stroll off any time you want, in comparison to having your first real big game out there. I guess I just shouldn't wear other games' shirts as I got asked if I work on the Witcher too many times. Meeting other devs and sharing this great event with all the feet aches and losing your voice over the week while trying to party a bit in the evenings is an immense experience for us. Especially with a huge assembly like the MEGABOOTH helping you with all above mentioned stuff. 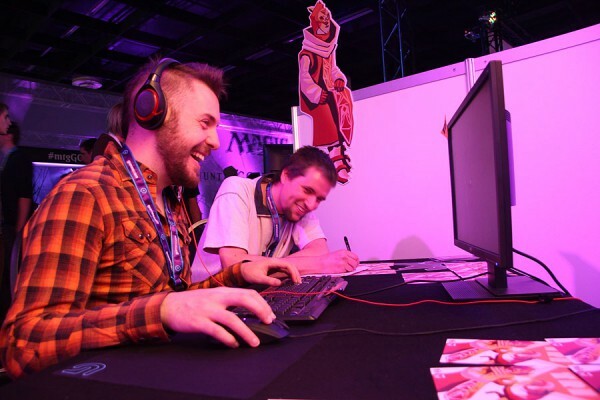 Having your own booth not only helps you with getting a lot more confidence with your game (instead of sitting in your cave while working nearly three years on it with just very few recognition), but also with getting in contact to press and people interested in your kind of game more easily. And as a player, it was pretty awesome to meet the nice guys behind games like The Talos Principle, Armello, Renowned Explorers: International Society, Tengami, Ghost of a Tale, Dungeon of the Endless and many, many more! Thanks for the great time, everybody! 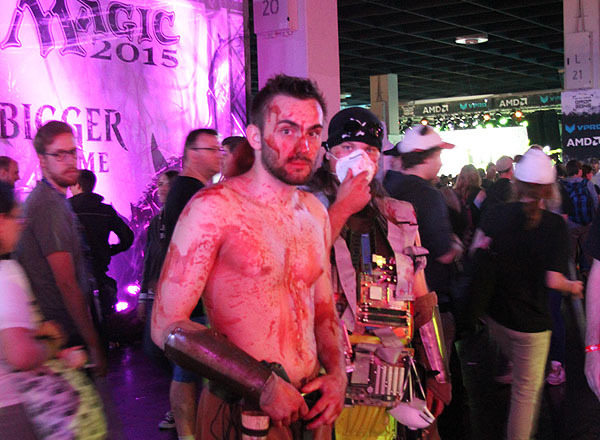 Want to hear more of the Gamescom from us?